The workplace undoubtedly has an impact on the health of its staff. Currently, at least two million people in the UK are seriously ill or sick as a result of something that has happened at work, and every year more than 400 are killed in workplace accidents. On closer inspection, we can see the imbalance which occurs in terms of male health – they are more likely to be members of ‘at risk’ groups, and less likely to be singled out for tailored care in the workplace. Overall, there are more men than women in paid employment (15.9 million men compared with 13.5 million women) and they are twice as likely to work full time (14.1 million men, compared with 7.8 million women). They also work much more overtime (29.9% of men work more than 45 hours per week, compared with 9.7% of women) and tend to work to an older age than women. This imbalance needs to be addressed. It’s time for a new approach – a need to increase men’s awareness of these issues, and encourage employers and trade unions to develop a ‘gender-sensitive’ approach to access to healthcare in the workplace. On average, men die four years earlier than women. Sixteen per cent of men and 6% of women die during working age. This reflects the fact that men develop a range of serious diseases earlier than women – 10 to 15 years earlier in the case of coronary heart disease, for example. Men typically take more risks with their health – they drink more heavily, are more likely to smoke, and are less likely to protect their skin from the sun. And they are considerably more reluctant to seek advice or help from a health professional. Men of working age visit GPs less often than women and it is the widespread experience of practitioners that men present later in the course of an illness than women. Yet, while men delay going to the doctor, they are surprisingly willing to take advantage of health services and campaigns in the workplace. A more holistic approach to improving workforce wellness is what’s needed. The foundations of this attitude lie in the ability to promote wider choice and greater flexibility in the delivery of primary care in the workplace the central objectives of current national health policy. A number of initiatives have contributed to the success of the Royal Mail Group’s approach. Collectively they seek to address the medical social and psychological causes of absence and to balance support for employees with a firm approach to tackling the issue. One programme has, for example, targeted back pain, while another addresses smokers. In terms of measurable results, the Royal Mail has achieved significant reductions in absence in recent years – from 7% to 5% between January 2004 and May 2007, equivalent to an extra 3,600 staff in work. Parcelforce Worldwide reduced absence from 7% to 4.5% between January 2004 and May 2007, equivalent to an extra 104 employees in work. Eighty-five per cent of Royal Mail’s 180,000 workers are male, which shows it is possible to make an impact on a male-dominated workforce. The media, trade unions and political forces increasingly put demands on businesses to be ‘responsible employers’. Research has proven that a positive impact on health at work can increase productivity and reduce absence. Following the Royal Mail Group’s example in addressing the ‘long tail’ of absence and investing in such policies among the 13 sectors in the economy with the highest absence rates would be worth £1.45bn to the UK economy. For companies such as Royal Mail, these policies represent a step in the right direction for men’s health. To go a step further would be for organisations to create gender-sensitive policies for health at work addressing the most pressing issues for men and women in the most appropriate way. Improving access, flexibility and the appropriateness of care in the workplace is, in my view, the key to this. Only then can we truly seek to redress men’s health issues in the workplace. Other areas have seen improved access to OH support services to include physio and occupational therapy. Meanwhile there have been improvements in the recoding of absence as part of the ‘Absence to attendance’ programme. While Royal Mail’s policies are not just about health awareness, there is a significant focus on this area. And it’s not just about preventing accidents and injuries, although this is a vital element. By following examples set by organisations that have yielded positive benefits, much can be done to re-think the traditional approach. Perhaps the workplace is a familiar and comfortable territory for them – unlike the GP surgery – and participation is much easier, requiring less effort and less time away from the desk or bench. 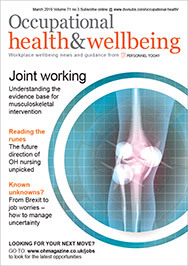 Improving health through action taken in the workplace is different from most established OH practice, where ‘health at work’ tends to mean the management of sickness or the elimination of risks to staff safety.